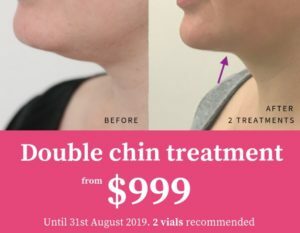 Home > Questions > Do we need surgery to remove sagging skin after double chin treatment? Skin laxity is assessed prior to double chin injections. Unfortunately, as we age, we we lose collagen and elastin from our skin. This can leave the skin with a sagging appearance, and when pinched, it takes a very long time to retract back to its original state. However, if you do end up with sagging skin after double chin injections, since we are removing the volume from under the skin, there are treatment modalities that ‘may’ help with skin tightening. These include, lasers, needling, ultrasound, or, surgery. The skin may take a couple of months to retract back after treatment. Using a good skincare, such as vitamin c to stimulate collagen synthesis, vitamin a to help with cell renewal and an anti-aging moisturiser, plus a sunscreen everyday will also help.